It’s not often that when I review a band’s breakthrough album the song list comprises of a generous amount of music to listen to. And quantity was what this Los Angeles-based 5-piece hard rock band was probably aiming for when they recorded this album the way they did with a grand total of 15 songs. Evidently Carbon 9 take their title of “the hardest working band in LA” seriously not to mention their message of never losing sight of humanity despite their use of modern technology that has forged out a unique blend of modern hard rock, industrial and even tribal sounds. It’s a particular deviation from what I’m normally into but there’s some good musicianship and vocals that work in their favor. What doesn’t work in their favor at first is the opening track “What Is It We’re Made Of” which could’ve given Type O Negative a bit of a run for their money if the song had been more than a minute in length. They quickly make the rebound afterwards with the driving “Crawling Over Me” with the dual vocals of Stacey Quineatly and Danny Cistone drawing some comparisons (at least to my ears) to Bauhaus’ Peter Murphy, Nevermore’s Warrel Dane and whoever fronted Lollipop Lust Kill for 5 minutes back in 2002. Their lead-off single “My Friend” continues with the momentum (as well as some more Warrel Dane-like vocals) and more highlights ensue with the hauntingly creepy “Mary Mannequin”, a new take on Danzig’s “Mother” whose vocals allow for hearing the lyrics more coherently for the first time minus the Elvis lip curls and the title track complete with bull-like grunting in the chorus. 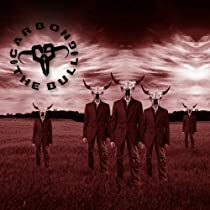 The only real drawback to The Bull’s vast songlist comes at around the ¾ mark when Carbon 9 start to sound a bit creatively spent and they start to aimlessly drop metaphors relating to butterflies in their lyrics by the time they reach the end of the CD. Yes, “Butterflies In My Head” is a good song but do we need more references to it elsewhere when it’s not really needed like on “Loving You” at the high risk of sounding like a Muzak version of Crazy Town for example? Even by ballad standards, that song made “Every Rose Has Its Thorn” sound like Children Of Bodom by comparison. With that said, the overall verdict on The Bull is, that for me, while my own musical palette yearns for something a little more ferocious and angry for me to give it the horns up, I also wouldn’t raise the white flag on this album and give it the fatal coup de grace that perhaps some metal fans might be inclined to do upon a first listen. It’s understandable but sometimes one prefers a burger over a steak just to make their diet a little more interesting. We’re only human after all.